With two pools to choose from and the beach just 5 minutes walk away, at the Hotel Aquarium there is plenty of chance to enjoy the sunshine. I’m just back from a 5 day break at this hotel. 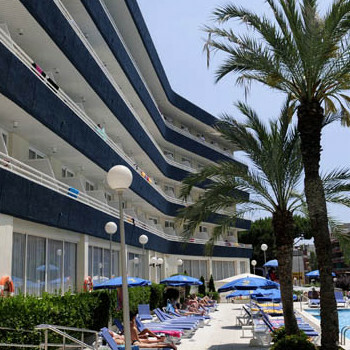 This hotel is situated in the Fenals area of Lloret, and is about a 5 minute walk from Fenals beach. I have stayed in most of the hotels in the Fenals area, and this is undoubtedly the best I have stayed in. It is listed as a 4*, and in comparison with the others which are similarly rated this one is miles in front. I think when I reviewed the Fenals Gardens I said that that hotel was civilised in comparison to others, but the Aquarium beats that. It is normally more expensive than the other 4* hotels in the area, but in my view it is very much worth the extra. On arrival, at around 9pm the check-in was very smooth. The receptionist was aware that the dining room closed at 9.15 and was most helpful in ensuring that I could have dinner if I wanted. I had other arrangements made but was happy with her helpful attitude. I had asked for a sea view –nigh on impossible from this hotel – but ended up with a view of the post office opposite. A pool view would certainly be my choice in order to get the most of the sun. My room was very clean and comfortable. The TV (with BBC1), toilet and a/c all worked fine. There was a hairdryer in the room which worked quite well. The rooms and hotel in general were all kept very clean, with maids working all hours. The pool is not huge, but was adequate for the hotel and while I was there it was not that busy. While sunbathing at the pool you can get served at the pool bar without having to go into the main hotel, and there are plenty of tables and chairs available as well as sunbeds. The food was very well cooked and presented and there was the usual variety. They had a chef cooking fresh omelettes some mornings and also fresh pancakes on other days. There was also a chef on the hot plate most nights cooking fresh food. It is worth paying for a coffee at the bar as that is much better quality than the free stuff available at breakfast. The bar was fine but not that cheap. €2 for a bottle of water or a fanta. The entertainment looked ok, from what I saw, but I did not stay in the hotel at night to watch it. I thought this was an excellent break in a clean hotel, and for the money paid it was great value. I have rebooked this hotel for my next trip. My parents and girlfriend have just returned from a wonderful stay in the Aquarium hotel. We found the staff to be very friendly which made a pleasant change. The food was very varied and there was always something on the buffet to please everyone in our party, if you like fish,you are in for a treat. The location was fairly quiet, so a short taxi ride to town centre of Lloret was taken on several occasions, a cost of 7 euros was the usual. The rooms were cleaned daily to a very high standard. Overall a big 9 out of 10 for this hotel. The hotel is situated in the quieter part nearer to Fenalls which is a lovely little bay and a lot cleaner than Lloret. Hotel is ok mainly Spanish and French which was a welcome change from the English - we didn't here another English voice for a week. Food is a matter of choice and their was plenty of it here. It could get repetitive as with all hotels but there was a choice from the grill which was cooked in front of you by the friendly chef a choice of salads, chips, pasta, and loads of others. We were at the back where the locals lived opposite and it could be noisy but we were in Spain and this is how the locals live. Avoid Lloret unless you like Kiss me quick hats & tatt shops - Its in serious need of a makeover. Get on the bus its cheaper than hotel excursions we went to Tossa which is lovely, and Barcelona which is outstanding. Entertainment is mainly for the young ones and in French/Spanish - lots of Brit bars everywhere if you like that sort of thing we avoided them like the plague though. We found this hotel to be nice and the food on the first 2 days was very nice but over the next 5 days it went down hill alot much to the point where we didn't go for another meal there. Saying that the breakfast was nice as I had it every morning with a wide variety of things to choose from. The Maids were quite pushy in the morning as even when we left the Do Not Disturb on the door, they still came in and quickly left when they saw us sleeping. As For our travel rep I think if I ever saw her again I would run for the hills. She was absolutly useless ever excursion she booked us on something wasn't right and she had made a mess of things, we had to chase round sorting her mistakes a number of times. For those of you who watch Coronation Street she looked like Fizz off it and so prompted us to call her that for the rest of the Holiday. The resort itself is quite nice and the excursions we did were Good despite the farce we had with 'Fiz'. Theres plenty to see and do. Would we go back, Maybe? who knows but at least we have given it a try. Saying that we created our own fun and had a brilliant time. I think lloret is a place to try at least once! Stayed at this hotel for 4 nights from the 30th September to the 4th October, first impressions, very nice! Rooms cleaned daily, staff very pleasant... food AMAZING! There is something for everyone. I am a very funny eater but there was plenty for me, I had 3 course meals every day.. There are lots of German, French and Spanish at this hotel but we get on with all nationalities. Pools very clean both indoor and outdoor, jacuzzi is fantastic. The weather was perfect 29 degrees everyday. Straight opposite the hotel is a friendly Spanish bar called Bogedon Sandra, very cheap beer if you drink there regular and the staff and locals that drink there are very friendly too. Will be going back next May with the kids for another long weekend. I would recomend the Aquarium to everyone. Overall a well run hotel, staff helpful and all speak good English, it was buffet style restaurant with a good variety to suit everyone. The entertainment was more aimed at families with younger children, there was daytime activities to suit most people if you wanted them around the pool area. One good game was naming cars, thats all I can say as it may spoil it for anyone thinking of going there, and all winner won a cocktail voucher? The hotel is very run down and in need of modernisation. We have stayed at far better hotels. Nothing luxiourious very basic. Room grimy and old fashioned and was unclean. There were always long black hairs on the bedroom floor and we have blonde hair so not from us. The pool itself was nice and walk in steps and a Jacuzzi but the pool area was basic and cramped. Everyone knew everyone round the pool and kids used to play ball and saw some kids playing with a cricket bat once. Not a snob but the class of people were rude larger louts with unruly children. Previously stayed in Maritim Princess near Salou and Zoraida Gardens Costa Almeria none of them a patch on this one. Although one good thing is the food was nice although for breakfast they only had bacon every other morning and croissants every other morning, had egg every morning but only one kind. One morning was omelette then the next was hard boiled and so on. But could not fault the food there was plenty of meat, fish chips every night as well as a different kind of potatoes. Although I do like a lot of salad and they only had onion and lettuce and that was it. The glass lifts are good they are best thing about the look of the hotel, behind that it becomes a 2 star self catering accommodation. Wheelchair cannot access the indoor pool or the area of grass to sunbathe on or where the entertainment games are played like darts, bowls etc, unless you use the service elevator to the underground carport a little demeaning. The entertainment day and evening is rubbish. Definitely choose a different hotel, we looked at the Olympic park when we were there and wished we were there instead. A most relaxing holiday. Extremeley clean, good choice of food and no trouble to find an empty sunbed. The staff were always friendly and polite.The outdoor jacuzzi was bliss!!.Recommended. Stayed there for 10 days at beginning of August 2002. The hotel overall is very good with all the usual facilities including internet access from the reception at 1 euro for 12 minutes. Most of the residents there were either french or spanish, having said that the dining room catered for all tastes and all the food seemed to be well prepared and presented. We never went for a meal and left disappointed. Sunbeds around the pool area are at a premium here with some visitors sending 1 person to grab 6 or 7 of them at 7.A.M All in all it was quite a nice hotel providing you dont mind the pre-breakfast sunbed race. One thing that was not mentioned in the brochure though was that the coaches to and from the airport cannot drive up the roads where this hotel is because the roads are so narrow and parked on on both sides, this may be different in low season but is worth bearing in mind if you have difficulty walking as 150 yards with your suitcase in tow can be hard work.